This project in the heart of Chelsea involved the reconfiguration and redesign of a pair of four storey brick houses dating from the 1960s, originally built in a New Brutalist style. Key to the success of the project was forging a strong relationship between the unified residence and its rear garden, which forms an urban oasis. The two buildings had previously been amalgamated but with limited success. A process of reduction removed any remaining divisions between the original houses, while a thoughtful design process offered the opportunity to create one cohesive and tailored home. 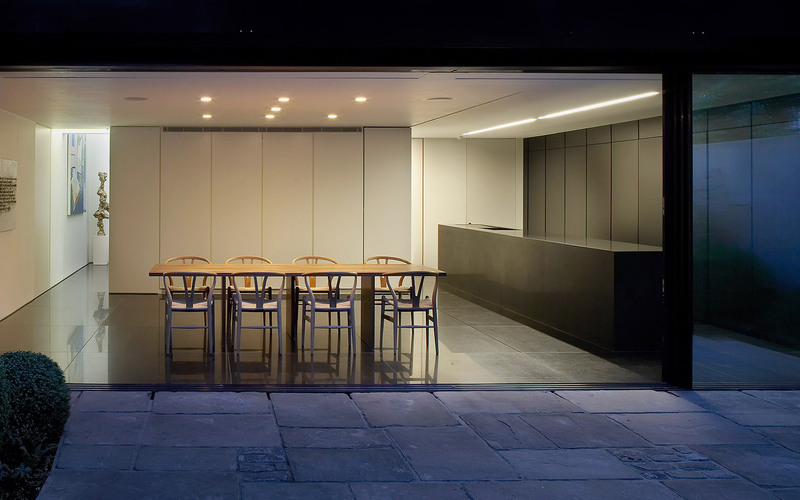 At ground floor level an open plan dining room and kitchen feeds into the rear terrace and garden through a bank of floor to ceiling glass, which stretches across the width of the house. The bespoke kitchen – which features a sculpted, granite island – is a subtle, minimalist presence complemented by ample provision of integrated storage.